After our previous experience with the IDO3D pen, we were incredibly excited to hear that IDO3D was now offering a vertical 3D pen. Vertical 3D pens allow you to write in the air. 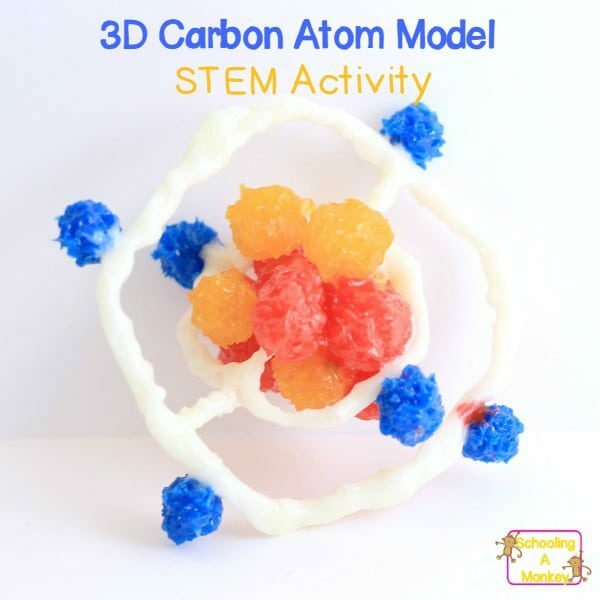 We decided to test this feature by creating a 3D carbon atom model. It is a fun STEM activity and introduction to engineering activities for kids! We’ve used 3D pens in the past to create engineering projects. 3D pens are the perfect tool for STEM activities for kids, because they not only combine engineering (there is quite a bit of structural knowledge you have to have in order for the 3D structures to work), but it also uses technology (the pen itself) and math (measuring to make sure different pieces fit together properly). 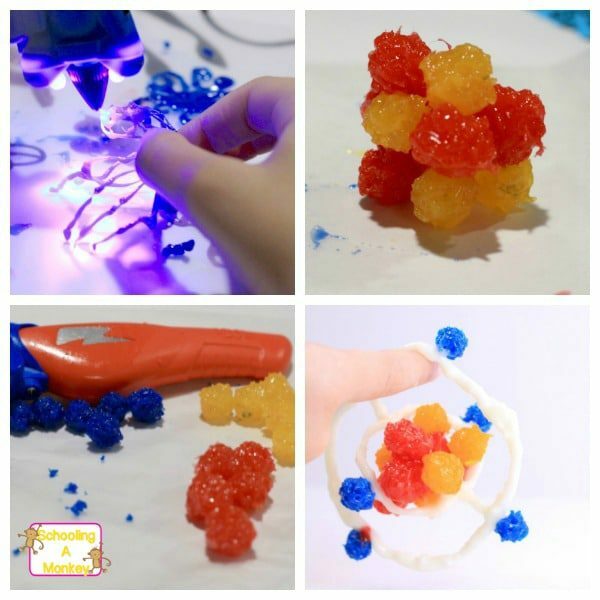 This time, we decided to add in the “S” and make our 3D activities for kids STEM-themed. Carbon is the sixth-most common element in the universe. Carbon atoms contain 6 neurons, 6 protons, and 6 electrons. 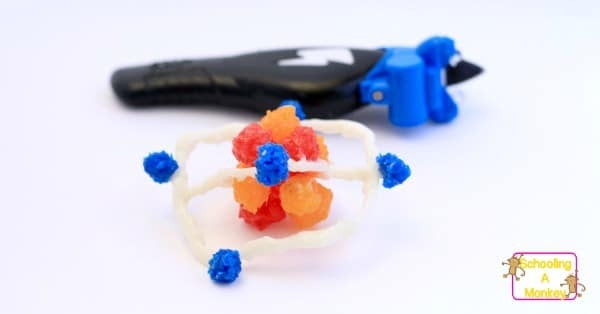 We decided that creating a 3D carbon atom model was the perfect way to test out the new 3D pen from IDO3D. We had to figure out how to make the individual carbon atoms and the circle for the electrons to go around the nucleus. Creating a circle with the 3D pen in the air, was the true test of this pen’s ability. Learn more about carbon, here! 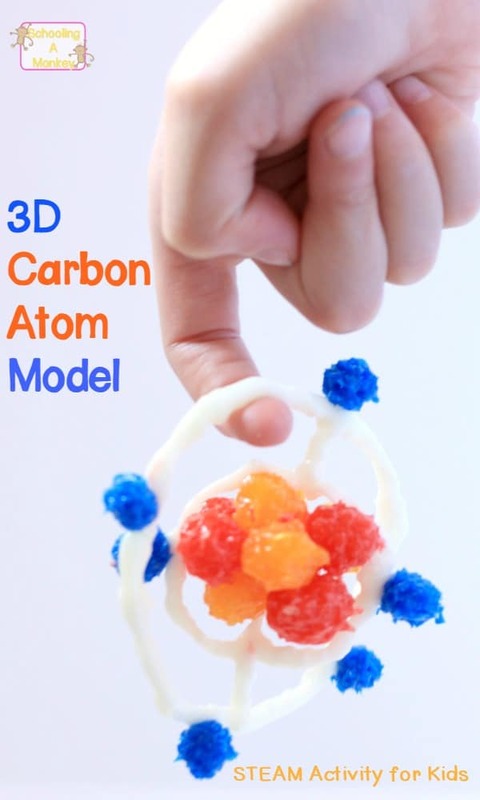 First, we created the individual carbon atoms. We made a circle from the ink, then dried it with the pen. While the 3D pen was still on, we drew into the air to transform the dots into balls. We made the electrons slightly smaller than our protons and neutrons. When the protons, neutrons, and electrons were finished, We glued them together with a tiny bit of ink. We used the 3D vertical feature to draw a halo around the nucleus to represent the path of the electrons. We made one small and one large loop. Two neutrons attach to the inner loop and four attach to the outer loop. Monkey was so eager to try out the 3D pen that we couldn’t just make one project! 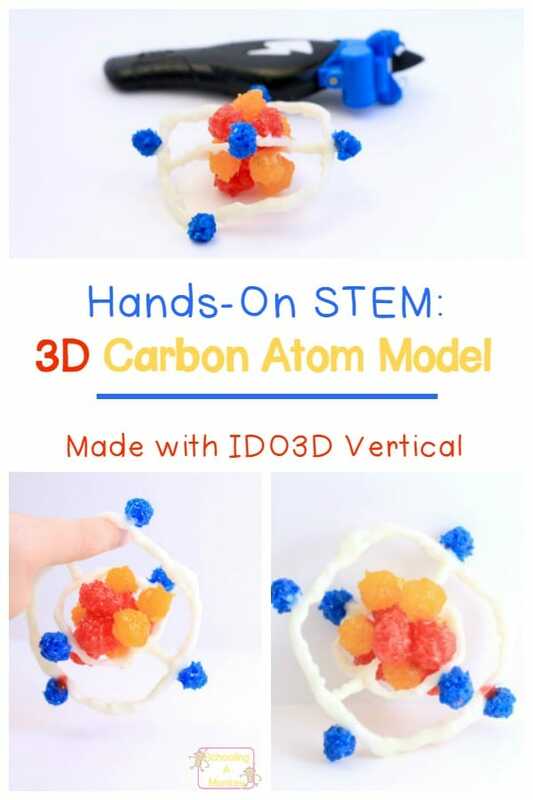 After making our 3D carbon atom model, Monkey made some of the projects out of the example book included in the IDO3D kit. The 3D pens are super easy to use. 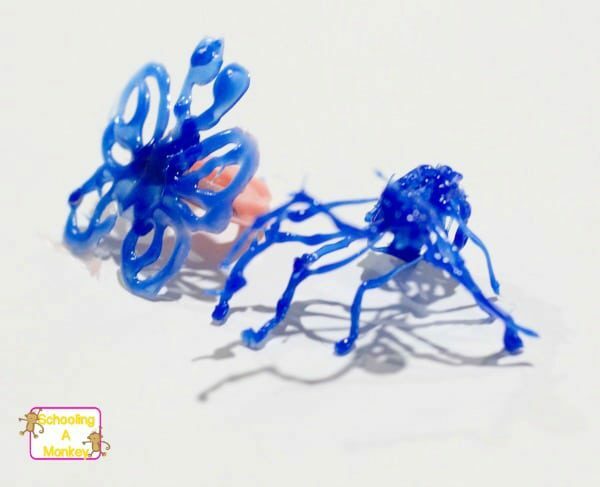 Last time when we tried the original IDO3D pen, we found it took a while to dry. Not with these pens! You simply squeeze out the plastic and the UV light hardens it right away. We did notice that after using our pen for about two hours, the light became less effective at hardening the plastic. Keeping fresh batteries in the pen is essential to your vertical success. At first, anything you make with your pens will look spindly, but with time, you can really create some magical creations. IDO3D offers quite a bit of training, which is really awesome. We found a mix of using the instant dry feature and painting without the light was able to give our project different textures.